The ShareMe 5 arrived in a box that looks similar to the ShareMe Pro, but thicker. The packing inside is slightly nicer looking. The plastic container holding the headphones is still made from very thin cheap white plastic. I wished they would use something else that looks a bit higher end, because the headphones themselves look very nice. The headphones come with a USB charging cable, as well as a 3.5 audio cable to use the headphones in wired mode. It is always nice to have that option — if this is the only pair of headphone around, and the battery just ran out — provided you do not have the audio jack-less iPhone 7 ! Mixcder has a winner here. Comparing this with the ShareMe Pro, the ShareMe 5 has a much more premium look and feel. Except for the headband, which has a strip of steel inside, the rest of the body is completely plastic. The metal looking ear cups look good, with just a small bit of shiny metallic plastic, the rest being matte metallic color. The ear cups on the ShareMe 5 folds up into the headband area. As far as I can tell, the hinges are metal mated with plastic. The hinge does not feel very solid, and I hope that it will hold up with use. The best part about the ShareMe 5 compare to the ShareMe Pro is that the ear cups is free to rotate vertically for about 15 degrees. The movement is small, but it makes all the difference. They fit onto my ears much better. My son and I keep swapping between the ShareMe 5 and the ShareMe Pro, and we both concluded that the 5 is much more comfortable. I also think that because of this flexible fit, the sound quality improved as well. The ear cups and headband are covered in soft leatherette over foam. It is of the same quality as my Jabra Move. My guess is that in a year or two of daily use, they will wear out. But for the price it is a nice setup. Because of the swiveling ear cups, and the large ear cups, the ShareMe 5 is very comfortable. The clamp force is average — light enough that I can use it for over an hour with no fatigue. For me the ear cup completely goes over my ear making a good seal. The foam pads press against my glasses slightly, but the pads are soft enough that it is not an issue. I am so happy that the controls on the ShareMe 5 is different from the ShareMe Pro. The 5 has a sensible layout — where on the right ear cup, there are up and down volume toggles, and a separate power button. There is no more confusion as to how to turn up or down the volume. The separate power button does double, or is it triple, duty as the play/pause/answer button. 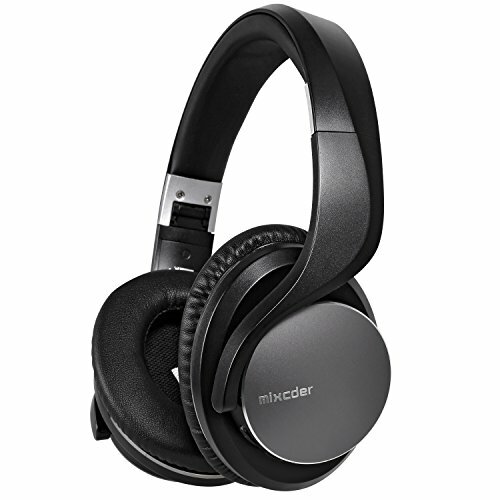 Just like the other MixCder headphones, the bluetooth connection is solid. Comparing to my new Bose QC30, the ShareMe 5, the MixCder has a much better range. It easily goes 30 feet line of sight before dropping the connection. Like most newer bluetooth device, when the connection is dropped, the sound is muted. So you will not get a blast of static. The battery life on the ShareMe 5 is impressive. Again I have problem doing a run down test because after leaving the headphone playing overnight, I still cannot drain the battery. For practical purposes, the battery is good enough for normal use. One slightly annoying issue with the battery — there is no way to find out the battery level. The power LED will change from blue to flashing red when the battery is low, but I want to know what is the level beforehand. I noted in my ShareMe Pro review that I experienced a audio delay when I am watching video with the ShareMe Pro. For some reason, it appears to me that the delay in the ShareMe 5 is gone. I watched an entire TV show on Hulu without issue. I don’t know if they have actually updated the bluetooth implementation, or if the perceived difference is purely psychological, but these new ShareMe 5 works fine with video. Since I already have a ShareMe Pro, I paired them together to test out the sharing feature. The two paired up easily (remember, pair them out of range of other bluetooth devices) and they play in the sharing mode without problems. The sound signature of the ShareMe 5 is similar to the ShareMe Pro, but slightly better to my ears. The overall sound is still compressed, vocals are slightly veiled. The bass is punchy which is good for rock and pop. Compare to a high end setup, the sound are not terribly detailed. Listening to Coldplay’s Viva la Vida, where the instruments are increasingly layered onto the tracks, some of the details are lost. When the music is less complex, for example Happy Theme Song by Grace Kelly, her Sax comes through warmly. The accompanying bass, piano and drums can be heard clearly. On Sting’s A Thousand years, the rumbling deep bass shows off the bass heavy sound. Overall, the sound is enjoyable for a US $ 60 pair of headphones. It compares favorably to the Jabra Move. The ShareMe 5 is a good pair of value bluetooth, over the ear, headphones. Sonically it is good enough. It looks much more expensive than it is built. It is comfortable. My only hope is that the folding hinge holds up over time. Otherwise it is a nice pair of value headphones on it’s own. And if you want the sharing feature, I would recommend getting a pair of ShareMe 5 instead of the ShareMe Pro. Note: I was given this pair of headphones free of charge for a honest review.